Selection of tree-stock type greatly affects the establishment and initial growth of new Radiata pine plantations. 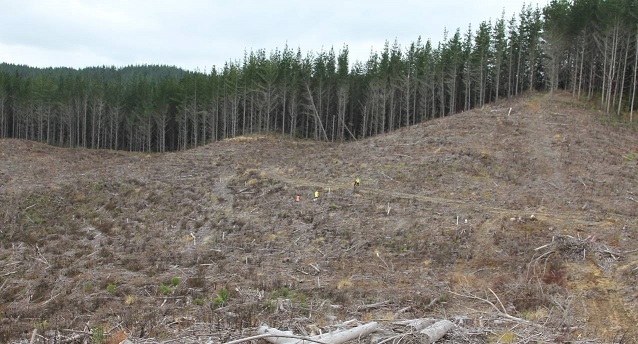 The two main stock types used in New Zealand plantation forestry are bare-root and container-grown seedlings. Bare-root tree-stocks are typically grown in the soil of field nurseries and containerised tree-stocks in special media mix in plastic containers. Container tree-stocks are the predominant tree-stock type in forestry applications in most countries around the world. New Zealand, for some reason, has continued to predominantly use bare-root tree-stocks although container stocks are becoming increasingly popular. Container-grown seedlings, unlike bare-root ones, retain their intact root system in a fertile growth medium plug after lifting. This “packed lunch” stays with the tree-stock all the way to its new home planted out on site. This makes container-grown tree-stocks more resistant to water stress, reduces seedling mortality and promotes rapid initial growth after planting. It also makes them less susceptible to poor planting practice. The container-grown tree-stocks used in the trial were grown from stand-select seeds at PF Olsen’s container tree-stock nursery near Waiuku (south of Auckland). The stand-select seeds were coated with a Trichoderma mixture for potential beneficial endophytes prior to sowing. The commercial bare-root tree-stocks were grown from GF19 seeds (2 sites) and CP seedlot (1 site) at nurseries in Rotorua and Northland. The bare-root tree-stocks were not treated with Trichoderma. The trial was in a randomised complete block design with five replicates and a minimum of 10 subsamples per block. Seedling height and diameter was measured at the time of planting and again at 122 days at Topuni, 350 days at Maramarua and 299 days at Lismore after planting. The results showed no significant difference in mortality between the two tree-stock types in all three trial sites. 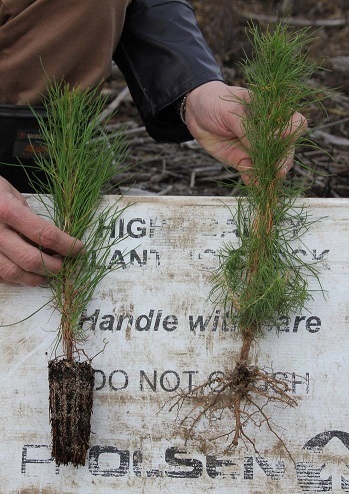 The relative height growth at the Topuni and the Maramarua sites did not differ significantly between the two tree-stock types but the container-grown seedlings at Lismore site had significantly higher height growth (+29%) compared to the bare-root stock. The major difference between the two tree-stock types is their relative diameter growth rate. 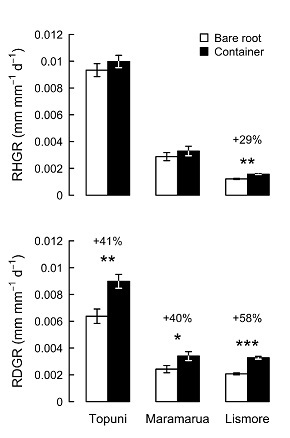 Across all three sites, containerised seedlings showed 41 – 58% higher relative diameter growth than bare-root seedlings and the differences were statistically significant (see graph below). The use of different genetic material for the two tree-stock types prohibited a joint analysis and direct comparison between bare-root and containerised tree-stocks. However, with the combination of container-grown and beneficial Trichoderma endophyte inoculation, even tree-stocks with inferior genetics (stand-select) can out-perform GF19 and CP bare-root seedlings and champion an early start in the field.